Part I – Defend Democracy – After Tuesday’s historic recall election and the victory by Jen Shilling and Jessica King, Progressives need to focus on defending the seats held by Jim Holperin (12th Senate District) and Bob Wirch (22nd Senate District). With the political future of the state hanging in the balance, these races require every effort to stand with Senators Wirch and Holperin on Tuesday, August 16th. Spokesmen for the Senators told Badger Democracy today that there is a tremendous push this weekend from both Senators in traveling throughout the district, making personal contact with constituents. In addition, scores of volunteers are hitting the phones and pavement in a final push to get out the vote. Both campaigns need our help! Holperin and Wirch are longstanding residents and fighters for the people in their districts, and Wisconsin. The GOP challengers in each district – Kim Simac (Tea Party “darling”) and Jonathan Steitz (Illinois-based Corporate Attorney, Free Trade advocate) would be disasters for their districts and the state. Help them GOTV by going to their websites and volunteering or donating today (Eagle River, Rhinelander and Kenosha County are beautiful this time of year!). If you cannot be there in person, you can help “Call Out The Vote” by going to www.calloutthevote.com and signing up for a “virtual phone bank” shift from home. Part II – Communicate the Message – At the Jackson County Fair in Kathleen Vinehout Country, the County Dems held an informal (but very telling) voter poll. Jackson County is a fairly split area of both moderate conservatives and progressives. Their poll gives a great indication of the message Progressives should communicate to resonate with Wisconsin voters moving into this recall week, and forward to recalling Scott Walker. When asked to name their top state spending priorities, the overwhelming choice was Public Schools, followed by affordable Health Care and Elderly/Disabled/Child Services (Badgercare, Seniorcare, Medicaid etc.). These are all issues that Democrats can and should win on – the preservation of Great Wisconsin Public Schools and taking care of our Seniors, Children, and those with Disabilities with an affordable, responsible social safety net. The poll’s primary question asks if Public Employees have a right to Collectively Bargain. Affirmative responses outnumbered negative nearly 10 – 1. Restoring Collective Bargaining Rights does resonate with voters, and should be a key part of the message – for no other reason than its economic impact. Part III – Economic Impact of Collective Bargaining – Our state and nation’s economic condition of a chronically recessive economy has allowed the Tea Party and neo-conservative elements to create a “debt crisis” as a means to push economic policies which will further stagnate the economy. One of the central issues to our state economy is the decrease in real wages over the past decade. Consumers (in an economy of consumption) have less disposable income based on real wages than a decade ago. 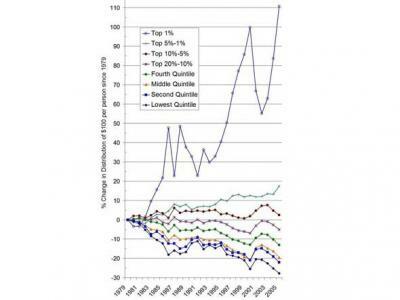 Subsequently, there has been a huge increase in the wealth gap – with fewer people controlling more of the wealth, shrinking the middle class economy. The Collective Bargaining benefits to the working middle class, jobs, and economy; Public Education, and caring for our children, seniors and the disabled are clear, resonating messages which can be carried into this week and on to the imminent recall of Scott Walker. Part IV – The Recall of Scott Walker – The petition drive and action to commence a recall, it seems will happen sooner rather than later – whether by authentic grassroots or deceitful GOP initiation. We need to be ready and unified now. The recall elections on the 9th demonstrated Walker’s vulnerability. In GOP stronghold districts, 33% (2 of 6) seats were flipped. When you look at the actual numbers for each district, the GOP garnered less votes in those areas than when Walker was elected. The fact is, Walker lost votes from a mere 9 months ago – and his poll numbers continue to tank. He is still very vulnerable, and we need to stay engaged and energized to accomplish this task. We must defend Jim Holperin and Bob Wirch, first and foremost. We must begin immediately with a message that will resonate with moderate Wisconsin voters, including the benefits of restoring collective bargaining rights to jobs and the economy. Finally, we must all unite in the greatest political movement since the Progressive days of Bob LaFollette. We have the opportunity to make history, and stem the tide of Corporate Anarchy – together, as One Wisconsin.